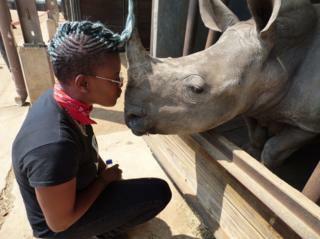 Image caption Pop star and Unicef ambassador Toya Delazy says the poaching of rhinos feels as if "we're losing our humanity"
Entrepreneur Sir Richard Branson and conservationist Jane Goodall have joined a list of famous names who have signed an open letter to South Africa's government calling for an end to rhino poaching. Only 20,000 or so rhinos remain in South Africa - the vast majority of the 25,000 animals left across the whole continent, says Traffic. Most of the 222 rhinos killed for their horn in South Africa's eastern province of KwaZulu-Natal were at the state-run Hluhluwe-iMfolozi Park. Conservation group Saving the Wild says a "web of systematic corruption" within the justice system is to blame. It says this has allowed poaching to continue in a province which saw poaching increase by a third. The campaign body says "no action has been taken against this grossly corrupt alleged syndicate of justice officials". "We are concerned that members of this syndicate are under political protection." "Even when arrests are made, few poachers ever go to jail. The law is not acting as a deterrent to this onslaught." South Africa's oldest game reserve, Hluhluwe-iMfolozi Park, became famous for its white rhino conservation work in the 1950s and 60s when it brought the sub-species back from the edge of extinction. "More than 8,200 rhinos have been killed by poachers in Africa over the past decade," says Julian Rademeyer of Traffic, a group which monitors the illegal trade in wildlife. "Corruption and rhino poaching are inextricably linked. In far too many cases, rangers, police, government officials - even magistrates - are easily corrupted by powerful criminal forces with ready supplies of hard cash. He adds: "In South Africa, several police crime intelligence officers - who are meant to play a key role in combating organised crime - have been implicated in rhino horn cases." The founder of Saving the Wild, Jamie Joseph, says there has been evidence of corruption by some magistrates and prosecutors dealing with poaching cases but action has not been taken. "I have worked with the Magistrates Commission and police on this investigation for more than two years, and I have seen how some justice officials put in charge of protecting our human rights and natural heritage are the ones causing the most damage," she said. The open letter calling for "the South African government to take urgent action against the alleged syndicate of magistrates and prosecutors" was also signed by Zulu princess Latoya Buthelezi, a Unicef ambassador who is also a pop star known as Toya Delazy. "The rhino is sacred to Zulus. The Zulu word for rhino - ubhejane - is a praise name given to the king," she said. "When we hear that rhinos are being slaughtered it's just so sad. It feels like we're losing our humanity." At the start of 2018 South Africa's environmental affairs minister Edna Molewa described rhino poaching as "a national priority crime," as she announced a 2% drop in the number of rhinos killed in 2017. "There have been arrests made for poaching-related offences from amongst our own personnel. Regrettably, during 2017, 21 officials were arrested in this regard." She added that South Africa's park management authority had "instituted a programme of integrity testing throughout the organisation, to support our ongoing anti-poaching efforts". Other signatories to the letter include wildlife photographer Thomas Mangelsen, and South African musician Vusi Mahlasela, who warned of the danger to poor communities. "Countless families in South Africa's rural communities rely on wildlife tourism for their livelihoods. If we have a voice, we should use it for those who do not." Video Could farming rhinos save them from extinction?